Toddlers on tablets. Pre-teens on Tumblr. Thanks to a variety of factorsâ€”from tech companies hungry for new audiences, to school administrations bent on making education digital, to a culture that promotes everyone as the star of their own reality showsâ€”technology is irrevocably a part of childhood, and parents are struggling to keep up. What should be allowed? What should be denied? And, given the ubiquity of technology and its inherent usefulness, what do sensible boundaries even look like? A noted columnist and mother of three, Naomi Schaefer Riley fully understands the seductive nature of screens. For example, an afterÂ­noon of finger painting equals enormous cleanup of both house and hands. But an afternoon of iPad games? Just a swipe and a charger. Or what about car rides around town? Always having toys and books on hand isnâ€™t a given, but your game-loaded smart phone is. Riley draws us into her story and then walks us through the research on technologyâ€™s encroachment into each stage of childhood. She then offers "tough mommy tips": realistic, practical, applicable advice for parents who recognize that unlimited technology access is a problem, but who donâ€™t know where to start in taking back control. These tips cover everything from placating an antsy toddler at your local favorite restaurant to best practices for keeping your teens safe from unsavory sites. Any parent knows the effects of screens on their distracted, cranky, sedentary, and incessantly anxious-about-what-might-be-going-on-without-them kids. 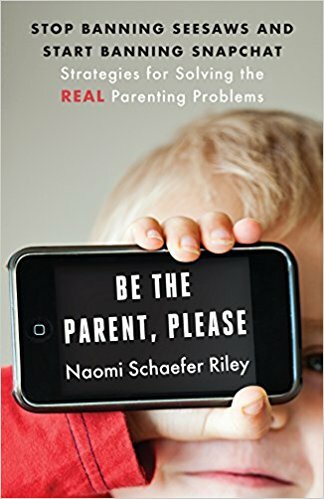 Naomi Schaefer Riley brings her experience, research, and no-nonsense candor to help parents prevent the children from falling under the destructive spell of technology.